A report from the Puget Sound Ecosystem Monitoring Program provides an overview of 2013 marine water quality and conditions in Puget Sound from comprehensive monitoring and observing programs. The objective of this report is to collate and distribute the valuable physical, chemical, and biological information obtained from various marine monitoring and observing programs in Puget Sound. Based on mandate, need, opportunity, and expertise, these efforts employ different approaches and tools that cover various temporal and spatial scales. For example, surface surveys yield good horizontal spatial coverage, but lack depth information; regular station occupation over time identifies long-term trends, but can miss shorter term variation associated with important environmental events; moorings with high temporal resolution describe shorter term dynamics, but have limitations in their spatial coverage. However, collectively, the information representing various temporal and spatial scales can be used to connect the status, trends, and drivers of ecological variability in Puget Sound marine waters. By identifying and connecting trends, anomalies and processes from each of the monitoring programs, this report adds significant and timely value to the individual datasets and enhances our understanding of this complex ecosystem. We present here that collective view for the year 2013. Moore, S. K., Stark K., Bos, J., Williams P., Newton J., & Dzinbal K. (Eds). (2014). 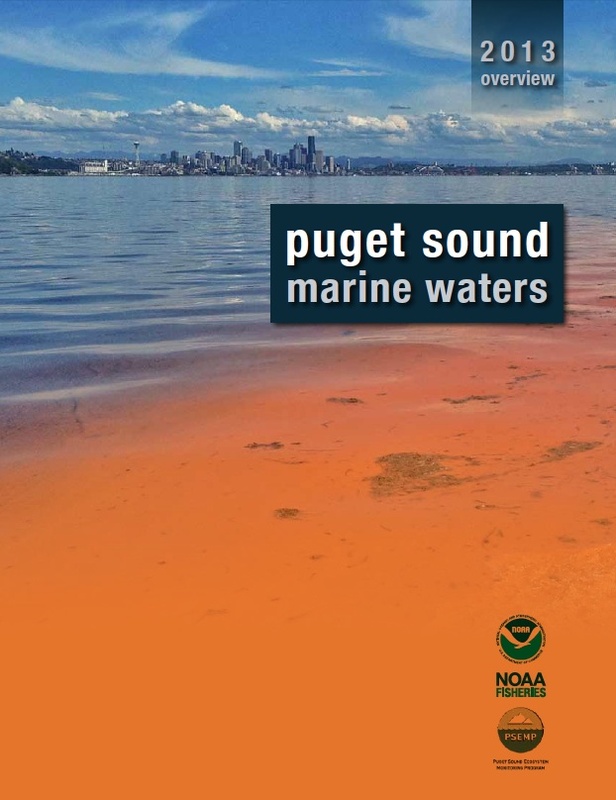 Puget Sound marine waters: 2013 overview. Puget Sound Ecosytem Monitering Program Marine Waters Workgroup, Seattle, Washington.